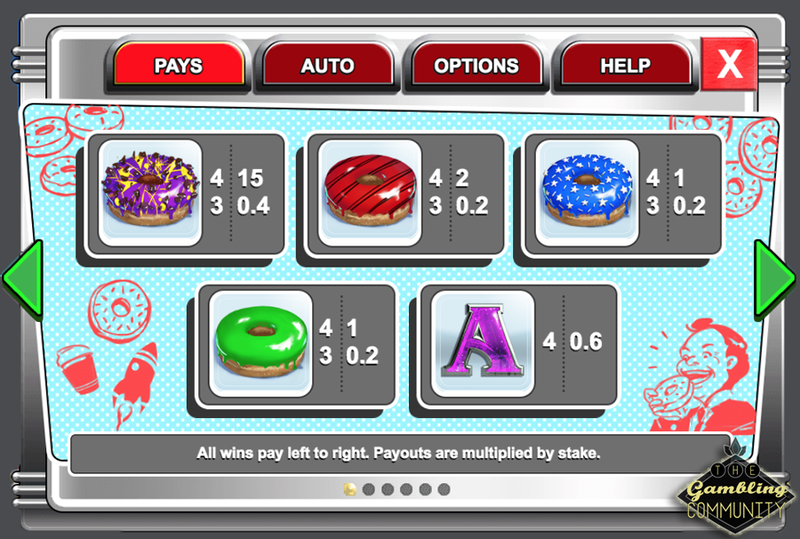 Donuts is another new slot from the hugely popular provider Big Time Gaming, it has a unique multiplier feature and by my maths has the highest potential of any BTG slot to date! 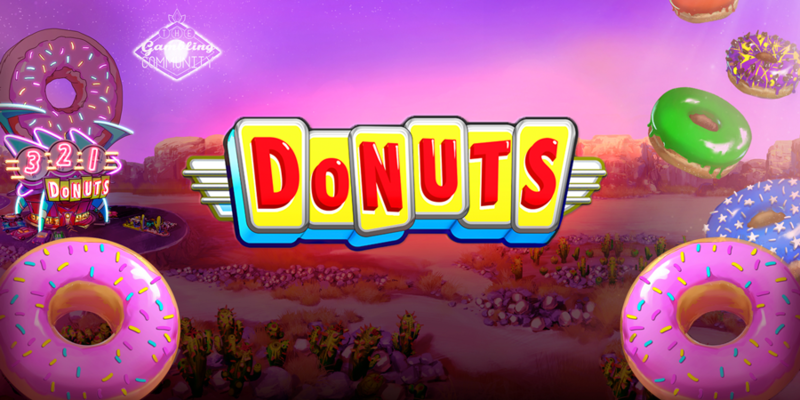 The theme is a random donut bar made from a rocket in the middle of the desert and you don’t have to be Einstein to work out the symbols are based on the sticky treat it’s named after, so lets get stuck in and see what this slot tastes like! Donuts has a 4 by 4 reel setup and boasts up to 2401 ways to win, now this didn’t make sense to me as you’d initially think it was 256 ways by the amount of symbols on the reels, however you can get multiplier wilds and donut boxes that reveal up to 4 donuts or wilds giving you many more ways than you’d first imagine. The boxes can land on any reel and open up to reveal there contents when the reels stop, it reminded me of the caterpillar wilds in White Rabbit but they seem to land very frequently and you can get more than one box per reel. To get the feature you need to land at least 3 of the golden donut scatter symbols, you get 12 freespins for 3 scatters and 20 freespins for 4, you cannot land 5 in the base game or the freespin round. 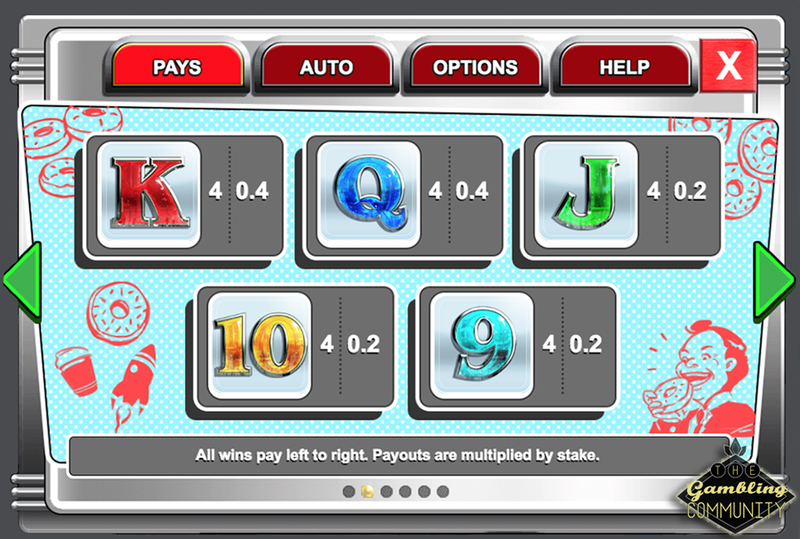 Once you win the freespins you are taken to the first part of the bonus as pictured below. 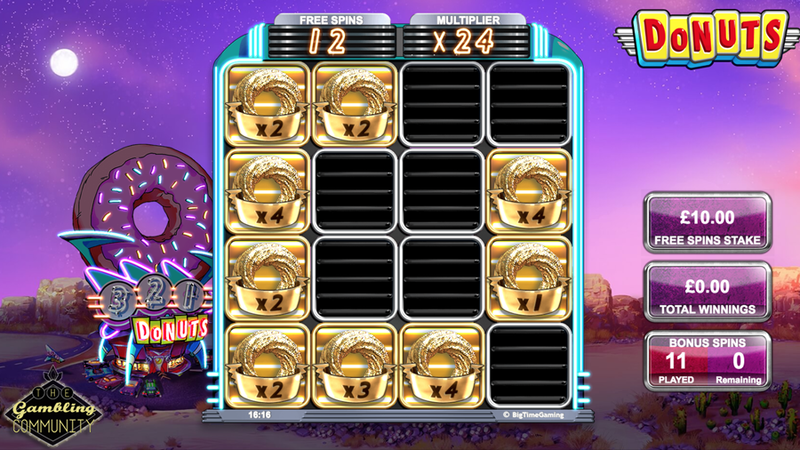 You start with 3 spins and each time you land a golden donut your multiplier increases accordingly and the spins reset to 3, once you have 3 spins without anymore landing the main feature starts with the multiplier locked for every spin! As you can see I had a total of 11 spins and got the multiplier to 24x, each donut can award up to a 50x multiplier and theres no mention of it being capped in the rules so that means you can get a maximum multiplier of 800x!!! 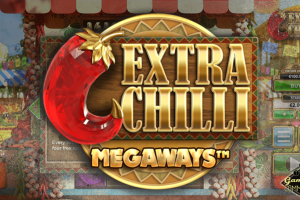 Now to the freespin round, you can retrigger the bonus and you will be awarded an extra 10 freespins for only 2 scatters, 20 for 3 and a whopping 30 extra spins for 4 of the golden treats. 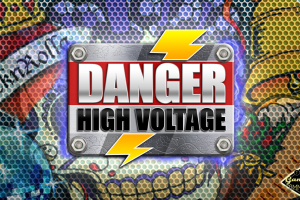 It’s also worth mentioning you can retrigger an unlimited amount of times which is very appealing, especially if your multiplier happens to be at 800x! Now onto the paytable, the pays are displayed as multiples of your stake and you can see the low paying symbols below pay very poor and only pay at all if you get a full line of them but were not here for letters, were here for donuts so lets swiftly move on! The aces pay marginally better than the other non premiums but its still not even the value of your spin for a full line. The green donut pays 1x along with the blue, the red donut pays 2x and in true BTG fashion the top symbol pays a huge amount more coming in at 15x your stake for 4. Now 15x might not sound a lot but when you consider you could have a 800x multiplier making that win 12,000x then chuck in the opportunity to have a 4x wild on each reel giving you 5 donuts per reel that win alone would be 7,500,000x your stake and thats without knowing at this early stage if its possible to have the full 2401 ways! Im gonna presume you cant as that would be ridiculous although I hope Im wrong! As a final thought all I can say is wow, this game seems to have pushed the boundaries and that is something as a player Im very excited about as it means others will have to follow or get left behind. 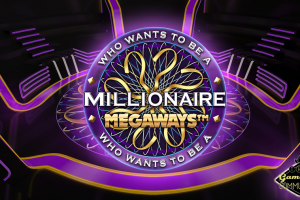 Knowing you could win life changing money on a low stake is something that appeals to all slot players and BTG have delivered handsomely with a very simple slot that has absolutely amazing potential. The RTP is 96.54% and the variance has to be in the super high category reserved only for the elite. It’s not available to play yet but as soon as it is I will update this review with a link below, thanks for reading and keep your eyes peeled for an update! Update: Link below to get your Donut fix! Click here to play Donuts!